You know the only thing I love more than Christmas? The build up to the actual day. I love the period from November 1st to December 24th MUCH more than I love December 25th. It’s not because I don’t love Christmas. I do. It’s just something about the anticipation to Christmas that I actually love a lot more. I can stretch it out and milk it for all it’s worth. And I DO milk it for all it’s worth. Christmas Day itself is often to me, too busy and sometimes chaotic to really be able to “stop and enjoy”. You wake up (sometimes early, but sometimes late). You open presents. You congregate and socialize with family. You cook. You eat Christmas dinner. You clean up the kitchen You go to a movie (or watch football). You come home. You go to bed. Boom. It’s over. Just like that. And then, THEN you have nothing but the long, dreary doom and gloom of January/February/March to look forward to until Spring starts to creep back around. Every year without fail, I always wake up on Christmas morning wishing that it was November 1st all over again. With-out-fail. It comes too fast. It leaves too fast. That’s my feeling about Christmas…and, about this series. We made it to the end. This post marks the 12 recipe in our 12 Days of Christmas series on Cooking is My Sport. We made it to the end. Just as it has been for the past two years, when the series is over I really do get a strong sense of nostalgia to go right when it first started. As much work as I have to put into it, I really do enjoy baking. And baking at Christmas for me just somehow feels even better and is even more enjoyable. Yes, even when I have to do it in these great big spurts where I churn out three or four recipes at a time then scramble to photograph/edit/and write posts for them. Am I saying that I’m gunning to crank out another twelve of these babies anytime soon? Nahhhhh, I wouldn’t go that far. I’m DEFINITELY going to enjoy a break from the constant baking/photographing grind. As will my feet, I can assure you. But I do miss the experience already. It’s a blast, and I honestly can’t wait until I get to start it all over again next year. I thought I make our last recipe go out with a bang. As you guys already know about me, sugar cookies are my favorite type of cookie to eat, no matter what the season. Give me a sugar cookie over anything. Amen. And for all the rest of you sugar cookie lovers out there, I think you ought to give this baby a try. It’s like, the sugar cookie of our dreams. It’s stupid easy. There’s no chilling or rolling out or cutting out of any dough. It’s thick. It’s soft. It’s chewy. For a simple holiday dessert that looks every bit as good as she tastes, do try a Sugar Cookie Cake. I’d like to once again thank everybody who followed along, liked or commented on the posts for this years’ 12 Days of Christmas series on the blog. You guys really are the best. Don’t worry: I AM going to reply to every single comment left on the posts. It’s just something that with the hectic process of baking/posting AND our move to a new place that I haven’t gotten to be as diligent at as I want to be. But I’ll get to it. Pinky Promise. Preheat the oven to 350°F. Spray a 9-inch cake pan with baking spray and line with parchment paper. Combine the flour, baking powder, and salt in a medium bowl and set aside. Combine the butter, cream cheese, and sugar in the bowl of a stand mixer with a paddle attachment (or use an electric hand mixer) and beat on medium speed until light and fluffy, 2 to 3 minutes. Add the egg, vanilla, and almond extract and mix until incorporated. Then add the flour mixture, bit by bit, to the butter mixture until fully incorporated. Press the dough evenly into the prepared cake pan, using your fingers to smooth the surface. Bake the cake until the edges just begin to turn golden, 26 to 28 minutes. (The center should still be soft.) Allow to cool completely. Run a knife along the edges of the pan before turning out and frosting. 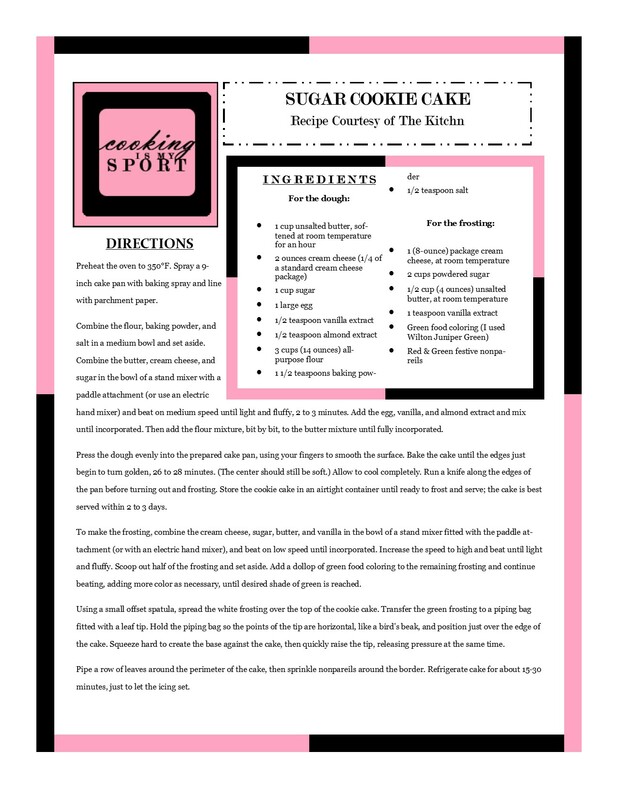 Store the cookie cake in an airtight container until ready to frost and serve; the cake is best served within 2 to 3 days. To make the frosting, combine the cream cheese, sugar, butter, and vanilla in the bowl of a stand mixer fitted with the paddle attachment (or with an electric hand mixer), and beat on low speed until incorporated. Increase the speed to high and beat until light and fluffy. Scoop out half of the frosting and set aside. Add a dollop of green food coloring to the remaining frosting and continue beating, adding more color as necessary, until desired shade of green is reached. Using a small offset spatula, spread the white frosting over the top of the cookie cake. Transfer the green frosting to a piping bag fitted with a leaf tip. Hold the piping bag so the points of the tip are horizontal, like a bird’s beak, and position just over the edge of the cake. Squeeze hard to create the base against the cake, then quickly raise the tip, releasing pressure at the same time. Pipe a row of leaves around the perimeter of the cake, then sprinkle nonpareils around the border. Refrigerate cake for about 15-30 minutes, just to let the icing set. Beautiful Jess, it looks like Christmas, thought your collection was fantastic. Merry Christmas to you and yours!! That sugar cookie cake looks so yummy–all the cookie recipes you’ve made sound great!